Retinal progenitor cells (RPCs) are multipotent progenitor cells that can give rise to all the six neurons of the retina and to the Muller glia. During retinogenesis, progenitor cells are gradually specified into lineage-restricted precursor cells, which then maturate into the terminally differentiated neurons or Muller glia. In mice, retinogenesis starts at E11. In the database the RPCs are separated into early and late RPCs. 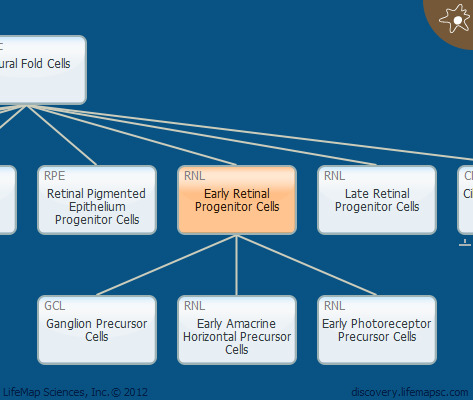 Early retinal progenitor cells appear at the optic vesicle stage of eye development. Early RPCs tend to symmetrically divide to increase the pool of progenitor cells in the newly formed optic cup. Then, the cells begin to asymmetrically divide, where one daughter cell differentiates and the second continues to divide as a progenitor cell. The early RPCs give rise to the early-born retinal cell types, including ganglion, horizontal, cone and certain subtypes of amacrine cells. The rod photoreceptors are generated throughout retinal development.